Google is launching a new feature for IT admins today that will make it easier for them to allow employees to use third-party apps in combination with its G Suite productivity tools. Like similar services, Google uses the OAuth standard to allow users of third-party apps (think email apps or calendaring services) to access their company data. While Google offers plenty of tools to avoid data leakage from its own services, though, there’s no guarantee that third-party services will do the same, and that obviously makes IT admins a bit nervous. With this new whitelisting feature, admins can now control which third-party apps will can get access to corporate data. Once this is set up, users can simply authenticate over OAuth and authorize access to their G Suite data like before, and IT can sleep soundly knowing that only authorized apps can get to their data. 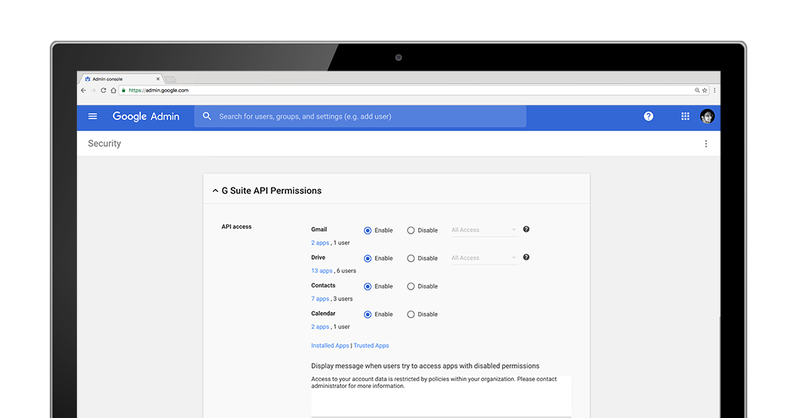 Using this tool, admins can manage API access to Gmail, Drive, Calendar and Contacts. This new feature complements existing G Suite security tools like Google’s Data Loss Prevention (DLP) tools for Google Drive and Gmail, which automatically scan outgoing emails and shared files for sensitive data and ensure that your users can’t send emails that include full social security or driver’s license numbers, for example.